Oh yes, I am doing a second Blog Link Up post in three days. I am on a roll! Today I’m linking up with This Ain’t the Lyceum for a blog link up called Seven Quick Takes, which takes place on Fridays. And, I think at least that it’s just about posting 7 quick things, supposedly around a singular subject. I think. Or at least this is what I’m going to do. (and again, I’m TOTALLY open to more suggestions for other blog link-ups to join; someone leave me a comment if you have other ideas! :)). 1. This is my 6th year working from home. I should be a pro now. Should. I work at online charter schools. I previously taught online Algebra 1 classes, and led a weekly Community Day program – this year though, I’m at a different school and heading up our vendor services program. 2. I’ve worked from home before I had kids, when I was pregnant, when I had one kid, and now that I have 2 kids. The ease in working from home has changed over the years. And with the different online schools I’ve worked for (here, here and here for explanation on the job changes). 3. Working from home with a baby (even when you’re still not sleeping well at night) is easy. EASY. I didn’t know how good I once had it. Babies lie there and don’t do anything. Even when they start crawling, you can stick them in a pack n play or bouncer with some toys and you’re good to go. They also take multiple naps a day. Or worst case scenario, you can strap them to you in a carrier and get stuff done. 4. 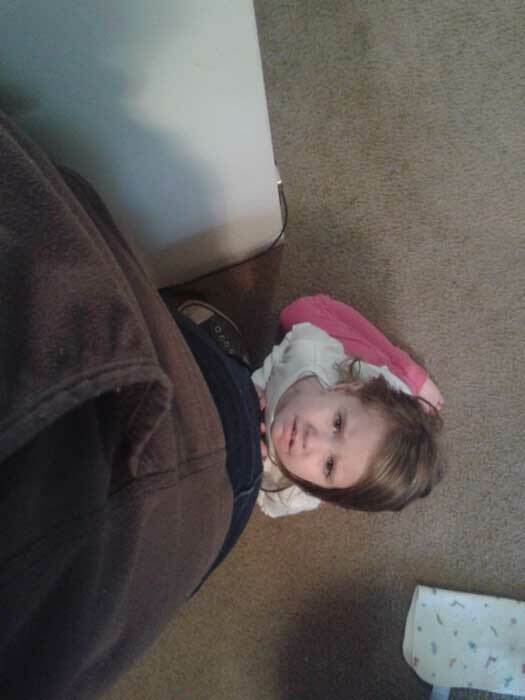 Working from home with a 3 yr old is not as easy. This is what my daughter looks like right now. For the record, I’m not ignoring her and have playdoh out for her to play with and fun Christmas music playing; does she want that though? No, she wants to whine for apple juice instead of the water she currently has. Sigh. I love her though. I have some childcare help a couple days a week for a few hours, and there’s preschool T/Th mornings, which help out a TON, but I really, really wish I had one of those kids who just likes to sit quietly and read books while I get work done. Do those kinds of kids exist? Do non-whining 3 yr olds exist too? I’d take a crying baby over a whining 3 yr old any day. 5. I’ve started following all these new bloggers who have lots of kids and still blog and homeschool and write books on the side and do all this stuff, and I have no.freakin.idea how they do that. No idea. I even grew up the oldest of 6 kids and am used to large families, and I still have no idea how people do so much stuff with more than 2 kids. 6. When I’m out in public (which isn’t all that often, to be honest) and I tell people I work from home, I’m often met with “Oh, I could never work from home, I need to be around people”. And part of me kind of thinks this is a bit humorous, because well, I’m really not some anti-social weirdo who doesn’t like people and that’s why I can work from home. It’s just about adaptation. I’ve long since adapted to the isolation that comes from working from home. No, it’s not easy, but it is what it is. That’s why I now have a blog, ha ha. 🙂 Do I miss seeing people on a regular basis? Yeah. Do I sometimes feel lonely? Yeah. Am I still thankful that I don’t have to fight L.A. traffic or do my hair or makeup on most days and that I get to spend so much time with my kids? Yeah, I am. I work from home and it is what is it. I don’t really know any other way to work anymore! 7. Speaking of work, my daughter is happy again and playing independently and I need to get back to work now. It’s been fun, my first 7 Quick Takes!